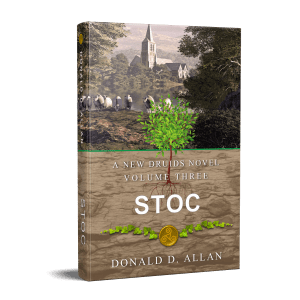 Donald D. Allan is pleased to announce the release of his latest book, Stoc (A New Druids Novel Vol. 3). We hope you’ll join us for this epic release event August 31st at 5 p.m. EST until 12 a.m. EST. We’ll start off with Donald D. Allan himself, then we’ll hear from some guest authors in the fantasy genre. This is a great opportunity to discover new authors, play games, and win prizes! 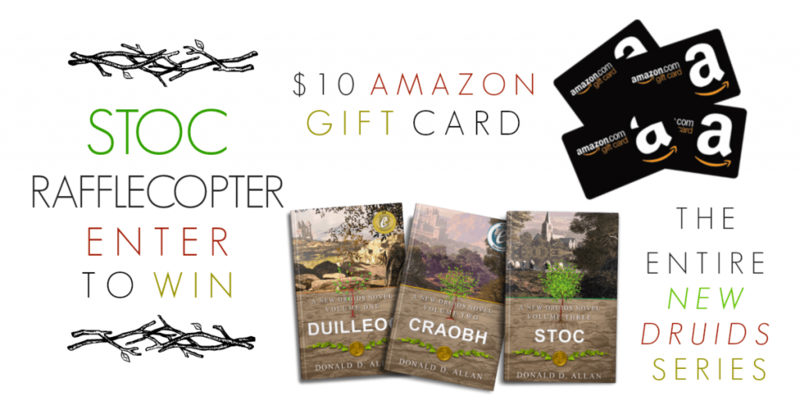 Speaking of prizes, don’t forget to enter the STOC Rafflecopter! Enter the STOC Rafflecopter for your chance to win! The entire New Druids series ebook collection. Don’t forget to share! There are several entries that can be performed every day! We hope you’ll join us for this epic release event August 31st at 5 p.m. EST until 12 a.m. EST. We’ll start off with Donald D. Allan himself, then we’ll hear from some guest authors in the fantasy genre. This is a great opportunity to discover new authors, play games, and win prizes! Speaking of prizes, don’t forget to enter the STOC Rafflecopter! James Bennett is a Yorkshire lad, making the big move to Oxford to start university. His ambitions involve getting a good education; impressing the Rugby Club; and not throttling his roommate. All perfectly normal drama, until Hallowe’en. A girl’s murder throws James into the dangerous world of witches, and those that hunt them. After playing a sidekick in the Witch-Hunter trilogy, it’s only fair that James gets to be centre stage in his own prequel. This can be read as a stand-alone, and does not contain any spoilers. It may contain witches, bad jokes and cringe-worthy scenes; but definitely no spoilers. Kelly S. Marsden grew up in Yorkshire, and there were two constants in her life – books and horses. Graduating with an equine degree from Aberystwyth University, she has spent most of her life since trying to experience everything the horse world has to offer. She is currently settled into a Nutritionist role for a horse feed company in Doncaster, South Yorkshire. She writes Fantasy stories part-time. Her first book, The Shadow Rises (Witch-Hunter #1), was published in January 2013, and she now has two successful series under her belt. Charlotte had just made her second coffee of the day, when she heard a very insistent banging at the front door. Not in the mood for visitors, she reluctantly opened it. And was met by the sight of James. James closed the door behind him, and made his way through the narrow corridor to Charlotte’s tiny kitchen. Charlotte promptly poured an extra coffee and added sugar, her normally bright eyes were red, and it was clear she’d been crying. “I broke up with Nathan.” She said, looking embarrassed that he had to see her like this. “I think my roommate’s a murderer.” James countered. “And he went to this warehouse, where…” James trailed off, his throat closing around the words. “Did you physically see him there?” Charlotte asked. “No, I was following a tracker.” James admitted. “James, you’re exaggerating.” Charlotte sighed. James opened his mouth the speak, but he didn’t even know what to say. He remembered getting knocked off his feet by some powerful force, but that didn’t make sense. “What did the police say?” Charlotte asked, when it was clear James wasn’t giving her an answer. “That’s normal police protocol for an ongoing investigation.” Charlotte said, knowledgeably. A full day of awesome Teen book events at the Barnes & Noble (Rochester Hills) location! Authors! Panels! Giveaways! You won’t want to miss this. This wonderful day will be hosted in partnership with Reuther Middle School, and will be a fundraiser for them. 1PM – “B-In The Know” Workshop. Readers will B In the Know at 1 p.m. with teen trivia, created by Penguin Random House, that’ll put your YA street cred to the test. 2PM – “B-Super” Workshop. Calling all comics fans: B Super at 2 p.m.! We’ll be celebrating iconic DC Comics superheroes and heroines, including Batman and Wonder Woman. Don’t miss trivia, mad libs, book excerpts from Leigh Bardugo’s Wonder Woman: Warbringer and Marie Lu’s Batman: Nightwalker, and a giveaway of two copies of Batman per participating store. And remember to wear your superheroic best for our costume contest! Joining us for this workshop will be author Heather Maclean – Author. 3PM – “B-Part of the Fun” Workshop. B Part of the Fun at 3 p.m., when we’ll be celebrating your favorite teen series with games, trivia, scavenger hunts, and more. Joining us for this workshop will be authors Erica M. Chapman and Heather Smith Meloche. 4PM – “B-Yourself” Workshop. This workshop will teach you all about the self-publishing world. Learn about writing, NOOK Press, print-on-demand books, and more! Join us and authors CK Brooke and Mackenzie Flohr – Writer. 5PM – “B-Creative” Workshop. Aspiring writers will want to B Creative at 5 p.m., with story development workshops created by Barnes & Noble’s NOOK and Adaptive Studios. Joining us for this workshop will be authors Ali Novak, Barbara Rebbeck, Erica Chapman, and Kristin Lenz. 7PM – MULTI-AUTHOR “NO FILTER” PANEL EVENT: This awesome panel of authors will be one you won’t want to miss! We will be asking them “no filter” questions and having a blast! Nothing is off limits!!!!! Plus, lots of giveaways! Joining us for this panel will be authors Ali Novak, Darcy Woods, Erica Chapman, Barbara Rebbeck, Mackenzie Flohr – Writer, Kristin Lenz, Rebekah Purdy, Heather Meloche, CK Brooke, and Heather Maclean. Ali Novak is the author of The Heartbreak Chronicles and My Life with the Walter Boys. Darcy Woods is the author of Summer of Supernovas. Erica Chapman is the author of Teach Me to Forget. Mackenzie Flohr is the author of The Rite of Wands. Barbara Rebbeck is the author of Nola Gals. C.K. Brooke is the author of Secrets of Artemis and the Jordinia series. Rebekah Purdy is the author of the Backstage Pass series, the D.B. List, and The Winter People trilogy. Heather Meloche is the author of Ripple. Heather Maclean is the author of Toward a Secret Sky. Kristin Lenz is the author of The Art of Holding On and Letting Go. Now the final battle has begun. Who will survive? Who will be left to pick up the pieces? Hailing from her native Trinidad and Tobago, Author, Illustrator, and lifelong bibliophile D.H. Gibbs found a way to blend her creative abilities with her love of the written word. From her early days, she spent many waking moments crafting tales, honing her graphic design skills, or dreaming up elaborate vacation plans to satisfy her love of exploring new locations. Her creative endeavors have afforded her many opportunities and inspired her to take her love of new and different worlds to craft Childrens’ and New Adult books for readers everywhere. When not writing, she can be found dreaming up new, fantastical stories for her fans or indulging her love of art, reading, or planning her next great adventure. Today I’m fortunate to present Greg Jolley author of Murder in a Very Small Town. Hi Greg, thanks for agreeing to this interview. Originally that oddest part of the world, California. These days, I’m enjoying the relative calm and sanity of Michigan. No matter the genre, it’s the mystery and suspense; the what will the characters decide to do? It’s the dance of the characters, caught up in the conflicts between good and evil. Through childhood, I was an avid and compulsive reader. Somewhere in my mid-twenties, I asked myself, “Why not write one? Contribute to the world of stories.” As is almost a requirement of first novels, Distractions (1984) was partially a mirror game of what was happening in my life, which wasn’t as interesting to me as taking the first steps into learning and enjoying the art and craft of stories. I write seven days a week, starting at 5AM with espresso brewing. I am firmly seated in the school that holds to the craft model and find artistic expression and exploration within each day’s efforts. I over write and over research each novel. I’m also open to whatever means get the words and story into play. Sometimes that is typing into my iMac, but of late, it has been four blue line notebooks laid out side by side and a cup of Pilot V5 pens and colored pencils. I also carry a notebook everywhere, as the books continue to percolate throughout the day. The latest book is Murder in a Very Small Town, in the suspense genre, where I’ve been living comfortable for the last few writes. I make the distinction between mysteries and suspense, grounded in exploring the dance between good and evil by sharing both the heroes and villains with the readers. With the writing of Murder, I was delighted to work with another odd Danser family member, this time Wiki, a twenty-something gay, headstrong and feisty woman. She kept taking the story away from me to make it her own. Every time I knew she was going to turn left, she steered right, over the median, planting her boot on the accelerator and taking off into the uncharted. The truck pulled off slowly to the side and braked to a stop. Now Wiki had the view of her headlights glaring into the snow-swept road–the two beams illuminated heavy snowflakes falling at an angle. The steering wheel felt fluid in her small hands, and she slowed down again to five miles per hour. Snow was clouting the underside of the car and sometimes white waves crashed up over the hood. There were furrows out before the car, from prior vehicles, but they were becoming harder to see and stay within. Anxiety, perhaps fear, changed the pace of her breaths and chilled her palms on the wheel. A highway sign appeared, lit by the white headlights. It read, Exit 143. No name of a town, just the distance to the exit. Even from within her personal storm of shock and sadness, Wiki understood that she could not go on much further. She turned on the right-side blinker, something that in her normal life would have made her giggle, what with her being the only car for miles. She slowed some more and began to watch for the furrows to sway off to the right. A single car-wide set of tracks continued into the narrow tunnel of the storm and Wiki turned off, staying within the white tire marks. The off-ramp was tree-lined and rose over a knoll, and there was a single yellow light swaying in the distance to her right. She rolled slowly down the other side of the hill and saw a tangle of cars, headlights, and movement. There was an accident at the base of the hill. Wiki lifted off the gas completely and began lightly braking the car. She was studying the scene a hundred yards away, feeling the car slowing and lazily wiggling its rear. The bridge supporting the trestle tracks was what changed everything. The car felt like it somehow accelerated. It is also began to slide sideways. Wiki took the wheel tight in both hands. She tried more pressure on the brake pedal. The accident was less than forty yards away, and she could tell that her car was picking up speed as it slid down the snow-covered ramp. Sara, the baby, and the heartbreak were forgotten. She could see two men working between three wrecked vehicles, prying on a door. Her hand went to the horn and stayed there, pressing it in a solid cry as she and the car slid closer and closer. Neither man seemed to hear or care about her approach. Not knowing what else to do, Wiki turned the wheel all the way to the right. The car stayed on its steady course for impact. Ten yards away one of the men finally looked up, but there was no time to do anything more than that. Her car struck the two men and hit the wrecked cars. Wiki rebounded on the seat after clouting her head on the wheel, and the two cars spun slowly away and her car, now crushed in at the front, slid past. Her car stopped when it crashed into a third vehicle. This impact had more force as she had hit a large tow truck. Her temple hit the steering wheel again as her car finally stopped. Wiki sat perfectly still, looking out around the raised hood of her car to the tow truck, ignoring the bump on her head, watching her wipers continue to brush snow from the windshield. She began to shake and could hear the storm wind and the damaged engine of her car. She was sitting there staring out into the view when her door opened and a frigid blast of air and snow swept in. She turned and thought she saw a woman’s face close to her; the woman had cloth across her mouth and her head was deep inside a fur-lined parka hood. Wiki heard and understood, but sat staring. Then she remembered her car striking the two men and that got her going. She unbuckled and climbed out, the wind whipping her heavy coat and summer dress and thin bare legs. She looked back up the exit ramp to the two cars she had struck. Their headlights were shining in the blowing snow, and she saw a man staring at the chaos with his jaw dropped. The woman had her arm around Wiki and turned her away toward the tow truck. “Should we call the police?” Wiki asked, feeling more and more in the moment. The woman opened the door and climbed in first with her hand out to Wiki. “Can’t call the sheriff,” the woman replied, waiting for Wiki to close the door. “Why not?” Wiki asked. She turned on the seat and looked out to the accident. The sequel to Murder is in the brilliant and capable hands of my publisher, with a January 2018, release date. It is titled, Malice in a very Small Town and in it, Wiki Danser continues her war against madness and evil. Hiring a professional editor for every book before it even reaches my publisher. I gladly go out of pocket for this invaluable service and expertise, working with brilliant and passionate editors who enrich each novel with substantive, line and copy revisions. Today I’m fortunate to present S.R. Mitchell, author of Shifted by Fate. I am a southern born Texas gal! A good story grabs ahold of the reader making the reader hope the story never ends and helping them forget where they are for a while. I have always loved to write. Writing is exciting and relaxing all at once. When I write I get lost in the story and it’s characters. I write when I can as often as I can. As a mother and wife, this sometimes means writing at night. I like to write for long periods of time. Shifted by Fate, Paranormal Romance. Kelly knew one thing when it came to Eric… He drove her absolutely crazy. Eric knew as soon as he scented her that she was his mate. And with other wolves now after her… he would protect her at all cost. Just all the ends and yours of the book community and finding my way through. Everyone in the book community are so welcoming, helpful, and I am enjoying every moment of it. Question 8) What can we expect from you in the future? I am releasin, A Chance to Love a Highlander, September 4th! This is the last book in my Historical Paranormal Romance series. Question 9) What was the best money you ever spent as a writer? Making sure I have a wonderful editor which helps to producing the brst work possible. Question 10) How can we contact you or find out more about your books? Today I’m fortunate to present Terry Marchion author of The Wrath of the Revenant. Hi Terry, thanks for agreeing to this interview. I live in the Pacific Northwest, in the Seattle area. It’s great because we have a little bit of everything up here – city life and culture, but just a few minutes away you can be in the middle of nowhere. For me, it’s relatable characters. The situations can stretch the bounds of believability (as they should), but if the characters aren’t “real”, then it won’t grab the reader. It was my love of serial tv (now I’m dating myself). I used to watch the old Flash Gordon and Buck Rodgers serials with my grandfather, as well as Star Trek and Lost in Space. These shows inspired the types of stories I started to write as a kid, which grew into what would become Tremain and Christopher. Work Schedule? What’s that? LOL. I have a day job too, which demands a lot of my time. So I write when I can. I usually have a notebook with me so I can write down ideas as they occur to me – then I try to get as much done on the weekends as is possible. I’m still working on forming a regular schedule for writing. I hasn’t yet happened, but it’ll come around. I’m not sure I have one yet. I’ll work on it!!! It’s the third “episode” in my series “The Adventures of Tremain & Christopher”, called “The Wrath of the Revenant”, now available. It’s a YA science fiction adventure. This one was a lot of fun to write – I hope it’s as much fun to read! “Tremain, this is my . . . father.” She said, indicating the metallic figure. Tremain cleared his throat, his momentary surprise forgotten. “He’s seen better days, I would imagine.” He walked over to the figure, examining it from all angles, the silver oval following his every movement. The voice again seemed to come from every point of the compass. “I do.” Christopher mouthed, hand in the air. Tremain paused, glancing over to Christopher, whose eyes were wide as saucers, then back up to the featureless ovular head. “That would, more than likely, be expected, yes.” He said, continuing his visual examination. “But, as I’ve always maintained, fear is a response to something we don’t understand.” He stood, running his hand through his hair. “I choose the latter.” He came full circle around the figure and paused, placing his hand on his chin and looking up at something on the ceiling, “or is it former? I never could get a hang on those. I’m a scientist, not an English major.” He shrugged. “And do you understand?” Came the voice. Tremain’s gaze shifted so he was staring hard into the ovular face. “Tremain, there’s something you should know . . .” Alice started. “She has no information for you. She is nothing but a construct.” Interrupted the voice. I have more adventures for Tremain and Christopher, that’s for sure – I have at least the beginning of the outline started (in my head) for the next book. I would have to say it was buying the first cover. I didn’t want to give it a shot myself as I had no idea what went into a book cover. After I realized that first cover wasn’t optimal, I started playing and re-designed that one to something that I felt was more in-tune with the tone of the book, then I did the second cover myself. The cover for my latest book I actually had done from a designer that did a phenomenal job – but without that very first cover, I wouldn’t have known where to even start.